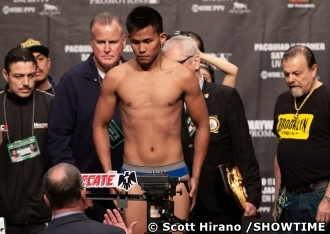 LAS VEGAS – Cebuano featherweight Jhack Tepora's rising career hit a roadblock at the MGM Grand Garden Arena here Friday afternoon after he failed to make weight for his WBA Interim super featherweight title defense against Hugo Ruiz of Mexico. Tepora came in 5.5 lbs over the required 126 lbs limit and didn't take the two-hour extra time to shed the extra pounds. Ruiz, meanwhile, stepped the scales at 125 lbs. Tepora was supposed to open the PPV telecast for tomorrow's Pacquiao-Broner welterweight championship but the fight has now been canceled. Ruiz's manager, the veteran and highly respected Sampson Lewcowicz, told Philboxing he had recommended for the cancellation of the fight because he didn't want to jeopardize Tepora's health. “I've been in boxing for a long time and looking at Tepora, I don't want to risk his health. Also he is already weighing as a lightweight. It's not fair for my fighter who had just been moving up to featherweight, to fight a lightweight,” Lewkowicz said. Ruiz will still fight in tomorrow's undercard but against a replacement in Alberto Guevarra who has a 27 win, 3 loss record for 10 rounds non-title fight. Tepora, meanwhile, will have to think hard how he is going to correct his approach to his fights, especially big fights. Tepora (22-0-0, 17KOs), who had an impressive 6-fight knockout run capped with winning the Interim title last July in Kuala Lumpur, was reported to be 40 lbs over when he reported for training for his fight with Ruiz just over a month ago. He arrived in Los Angeles last week still 20 pounds over. During yesterday's undercard presscon, he was still six pound overweight. Tepora started his pro career at Cebu's Omega Gym and has been considered its brightest prospect. Tepora however had a falling out with the Omega management after his brothers, who were trainers of the gym, ceased to be employed by the gym and Tepora stopped to train there. Jhack Tepora stepped on the scales Friday afternoon at the MGM Grand Garden Arena in Las Vegas. Omega Gym president Paulo Castillo told Philboxing last month that they still have a two-year managerial contract with Tepora and when he learned that Tepora was to fight on the Pacquiao-Broner undercard, he told Sean Gibbons of MP Promotions [who had a three-bout promotional contract with Tepora] that he could not guarantee whether Jhack would be fit enough for the fight. “I told him we no longer have control on Jhack and it is at your own risk if you push thru with his fight,” Castillo said. After today's fiasco, Tepora will now have to rethink how to bring his career back on track.